Don't let your dog hurt its back.. and save your own back, too! A dog and a car—sometimes these two things don't mix. Whether it’s because Calvin just can’t seem to wipe his paws correctly before he gets in or he can’t seem to sit still while you're driving down 64th Ave., taking your paw pal for a drive might not be as easy or fun as you would hope. However, some problems might just start even before you put the keys in the ignition—how your dog gets into the car! These dog ramps can help your dog climb safely inside your family van or head into his place at the back without jumping too much, avoiding too much strain on their joints, and if you help them up—avoiding too much strain on your back. 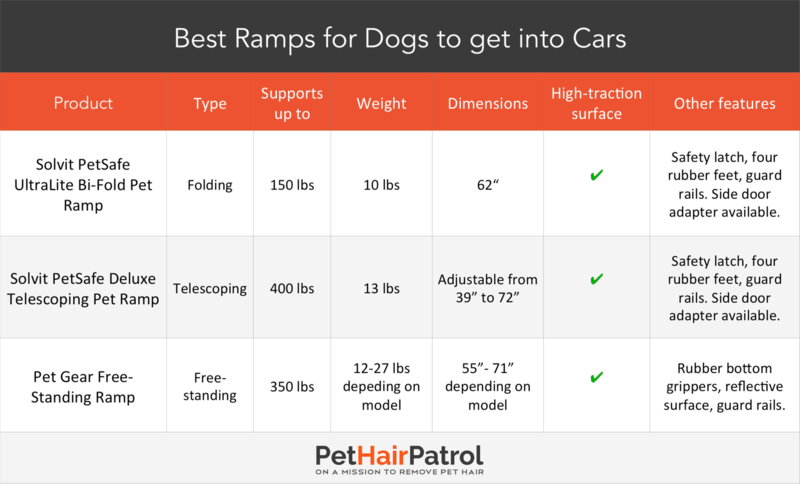 The simple solution of a ramp can help eliminate these issues and make taking the car ride to the dog park much more enjoyable (or make the vet visit more endurable). 2 Why a ramp for your dog is a good investment? 3 How to choose the right ramp for your situation? Why a ramp for your dog is a good investment? Constantly jumping in and out of the vehicle, even though it might not be that high of a jump can wear on the joints over time. It can also cause all sorts of injuries right on the spot, if done incorrectly or if something scares your pooch mid-jump. The smallest of errors in judgment can mean a knee or hip problem from a simple exit out of a vehicle. Some long-term complications that can happen due to entering and exiting a vehicle over a duration of time can be joint pain, like hip dysplasia since they land on their paws—and they also might not do so gracefully. Especially if your dog already has arthritis or joint problems, the last thing you would want to do is to cause them any more strain or issues—however, it’s possible that something as simple as taking them for a ride can do just that. The car ramp gives them the support they need to get in and out of the car, easily and with the least amount of strain as possible. Not to mention, especially if you lift your pooch in and out of the vehicle—no matter how light they may be—can cause you strain after a while. If 80 percent of the human population will indeed experience some sort of back pain in their lives, why would you want to increase the chances of you being part of that 80 percent if you can avoid a little more strain by helping your dog get in and out of the car? How to choose the right ramp for your situation? 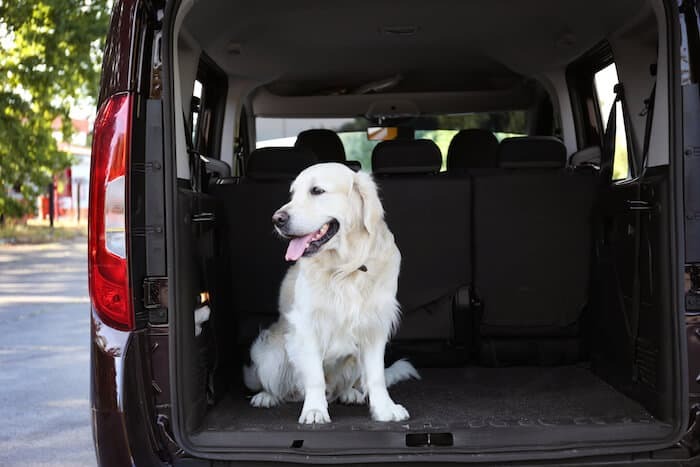 Whether you have a fur baby just getting over an injury, if your dog is getting older and older or, if your dog is simply too small to take that leap of doggy faith, you might need to invest in a dog ramp for your car. 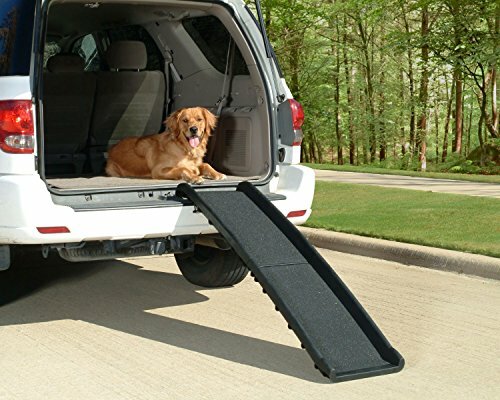 It is a specially designed ramp that will fit the back of your vehicle and can be pulled out to help your dog safely walk in and out of the car without having to make a big jump. Not only should you pay attention to the weight of the ramp, but you should also pay attention to the weight restrictions of the ramp itself. Having a lightweight, manageable ramp is important for you to be able to lift it in and out of the car (or move from car to car) but you shouldn't be sacrificing quality for numbers in weight, either. For example, a lighter ramp might not be as durable or sturdy, which can ultimately put your dog in danger, too. The ramp should also be able to hold your dog—especially if you have a bigger one. No matter if you think it’s a short distance, anything can happen! You don’t want to put you, your dog or your vehicle at risk because of a small detail that can easily be checked. Speaking of putting your dog or vehicle at risk, check into the safety of the ramp you're looking to purchase. Check if it has its credentials and enough positive reviews to back up its said qualities. Just because it makes promises and looks the part, it doesn't mean that it’s 100 percent safe. You don't want to end up with an injured pet or a scratched up car! The type, model, and size of car that you have may affect which kind of dog ramp you need. If you are already looking on the market for a dog ramp, get ahead of the game and go ahead and measure out the car(s) you'll be using. The measurement you need to take here is really pretty simple. Use a tape measure and go from the access point of your car to the ground. Estimate which angle is most comfortable and from there, see how far it is from the ground to your vehicle. This is where the measurements may differ—the access point. It could possibly be the top of the bumper, the floor of the trunk or if your dog likes to ride with the kids in the back, the floor of the backseat. The ramps should have a reasonable incline with not too steep an angle—or it defies the whole reason behind the purchase. Especially if you have multiple cars to transfer the ramps, you will want to have the easiest assembly possible. If the dog car ramp is difficult to assemble, this should definitely be a negative point in the choosing process. Some of these dog ramps come separated in several pieces, some just come in two—there are advantages and disadvantages here, and you should look at other features to decide which is the best pick for your situation. For safety precautions and ease of use, the ramps should have adequate grip so that your dog can make it into the vehicle safely—especially if they are going quickly or if it’s raining outside. If the ramp doesn't come with much grip, there should always be additional features, like replacement covers, that you can add to the ramp to make it safer and more plausible for your dog. For those looking for an affordable option that gets the job done, this ramp is a great choice. You can find it in different sizes to match the height of your car and the size of your dog. 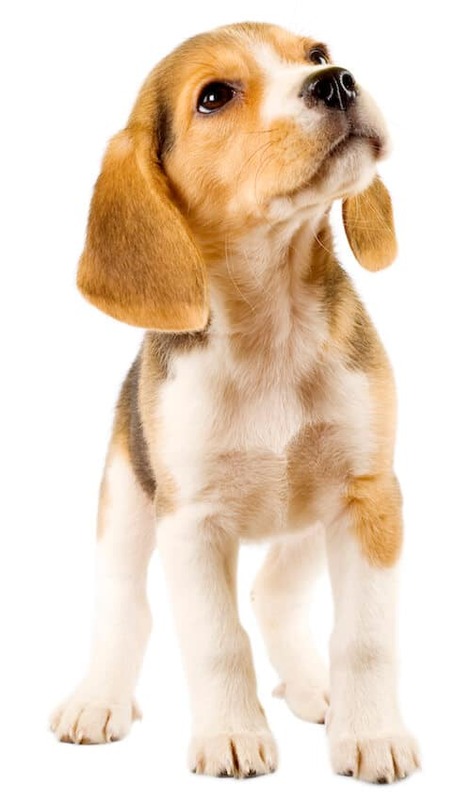 PetSafe brand is one of the leading American manufacturers for all pet-related products, including behavior, lifestyle, and containment materials. They have been in businesses since 1991. The Solvit Pet Ramp is an affordable choice, especially for someone with a smaller or lightweight dog—not because of the maximum weight it holds but because of the narrow build of the ramp. Since it is so light and weighs just 10 lbs, the SolvIt PetSafe Ramp is extremely easy to carry. Not only is it light on your back, but it also has a convenient handle and a safety release latch, which assures minimal accidental openings while moving it from one car to the other. The ramp itself weighs only 10 lbs, but it has a weight capacity of over 150, which means that it can hold larger dogs. It is compatible with most vehicles such as cars, SUV's, and minivans. It has a high-traction walking surface that is textured (much like a skateboard) to help prevent slips. This feature is especially important for older dogs and dogs with mobility issues. The ramp itself also is pretty stable, with four rubber feet to keep it in place while in use. Maintenance is also relatively easy, requiring only mild detergent or water to wash it off. It also comes in a space-saving design, folding easily in half to store, with a safety release latch to keep from opening when it’s not supposed to. + Its flooring is textured with high-traction, keeping dogs safe from slipping. This ramp is an excellent and affordable option to help your dog get into the car. Though pretty simple in design it has all the features you want a dog ramp to have. It's easy to use, safe and it comes at a reasonable price. This telescoping pet ramp is a great option if you're bigger dog needs a bit of help to get into the car, especially if they are starting to feel the effects of an injury or old age. The Solvit Pet Ramp is an affordable choice, especially for someone with a medium to a larger-sized dog and it works extremely well in the rain because of the traction. PetSafe brand is one of the leading American manufacturers for pet supplies. 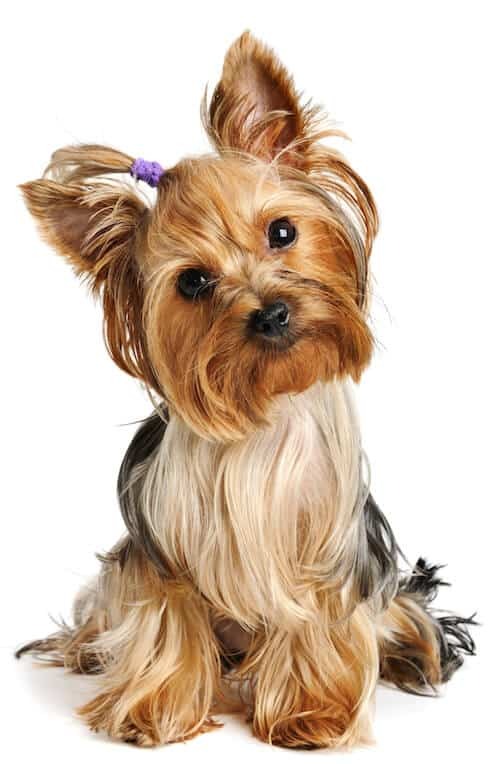 They have been in businesses since 1991 and are known for smart and durable products pet owners can rely on. Since it is a telescoping ramp, is it more compact than a folding one, making it easier to move, transfer, and store. It also is made from a combination of aluminum and plastic, which makes it light and strong at the same time. The Solvit Telescoping Ramp only weighs 13 lbs, and is compatible with a pick-up truck, an SUV and can be fully extended even to reach a grooming table. It has a high-traction walking surface, which is designed with texture to reduce the chances of slipping, which is extremely important for larger dogs. A practical feature on this ramp is the raised guide rails, which help give your pet a more secure feeling while walking on it and can eliminate the chances of them jumping on and off before they reach the end. It also boasts an ultra-stiff design and uses four rubber feet to keep it stable. To carry and stow, you can also take advantage of the carrying handle and the safety release latch to keep the ramp form opening when being transferred from one place to another. + Easy to use and extends relatively far out. + The guiding walls try to eliminate the possibility of falls or early jump-offs. + You don't have to worry about folding and unfolding with its design. + Easy to clean with detergent or water. - The high-traction surface might feel uncomfortable for sensitive paws at first. If you need a car ramp for your dog that is quick to assemble, durable and safe, this is a great choice. It is sturdy yet easy to use, and the length can be adjusted to fit many different kinds of cars and other uses. With an easy-to-use design that can easily be stored and stowed, the Pet Gear Free-Standing ramp is a perfect decision, no matter what size your dog may be—or how high your car may stand. They offer four types of free-standing ramps from which you can choose the one that fits you and your dog. A free-standing ramp is a good choice for a larger or older dog. It offers more stability and less wobbling than the traditional type of ramp that rests on the edge of the car. 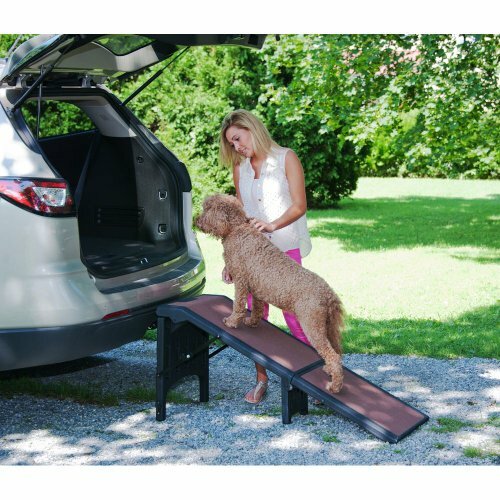 That is why the Peat Gear Free Standing Ramp is a perfect choice for owners who have older dogs who may have joint issues or need a leg up in the car. They also offer a carpeted version, which may be the most comfortable type for the paws of an old dog. Pet Gear Inc. designs and distributes pet-related innovative products. In business since 1936, they produce all kinds of products for your dog or cat, from booster seats to strollers, ramps to stairs, and crates to carriers. Especially if you are always changing the car you travel with, being able to fold up and switch vehicles is extremely important and is not just a luxury but a must. This product boasts its easy manageable size and shape; you can move it wherever you're using it and then stow it away carefully and quickly. With the easy-to-fold design that folds up quickly and simply, you can get the ramp into a smaller, more manageable size so you can easily stow it away, no matter which vehicle you drive. The floor of the dog car ramp is also skid-resistant, featuring specialized material to make it as non-slip as possible—even when it’s raining outside. When you need to clean the ramp, you can easily remove the flooring tract to get an in-depth clean. You also don't have to worry about sturdiness. The bottom of the ramp is fixed with rubber grippers so that it is kept in place at all times. Although it’s a bit heavier and more expensive, the features and stability it has really set itself apart from the other car dog ramps on the market. The dog ramp can carry dogs up to 350 lbs and has raised edges to guide dogs safely into the vehicle. The Pet Gear ramps are also reflective to provide additional safety when loading or unloading a car in a busy area. - Because of its stability, it is a bit heavier than most ramps on the market. If you're looking for a sturdy and easy-to-access ramp for your heavier or older dog, you may want to opt for this one—especially if you have multiple cars. The Pet Gear free-standing ramp is steady, secure and easily managed, and it will adjust to many cars and situations. Why do I need a ramp for my dog to get into the car? Well, you probably already know why because you are reading this and looking for a ramp. Nowadays it common to have an SUV or another high-built type of car. Smaller dogs might no even be able to jump up to get into the back of the cat or the back seat, and for larger dogs, the jump can be difficult and cause strain on their joints. Older dogs often experience pain when jumping, and you might not always be able to help them out by lifting them up or down. Using a ramp for exiting and entering the car is safer for your dog and makes things easier for the owner. You don't have to lift your dog and get yourself dirty after a muddy play in the park. And with bigger and heavier dogs you might not even be able to pick them up. With an easy-to-use ramp loading and unloading your pets from the vehicle is easier, quicker and safer. That's why. Which option should I get? You can usually choose between a few different options: stairs or ramps, and free-standing or leaning. Most people will opt for the ramp, because it is easy to pull or fold out and to put back in. This type of aid is more than enough for most dogs, but some are afraid of the incline and refuse to walk up and down the ramp. 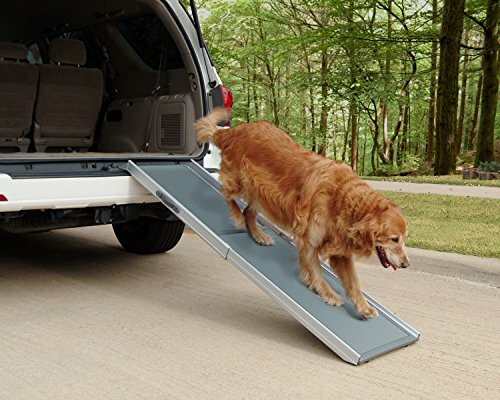 In most cases, you can train your dog to use the ramp, but if you know your dog would prefer stairs or steps, Pet Gear has the perfect solution for you with their free-standing easy-to-assemble dogs steps for a car. The other question is whether you want a free-standing ramp or the type which is set resting on the back of the car. Again, most dog owners prefer the traditional kind that is set leaning against the vehicle. This type is usually a bit more convenient and practical, but it can be a bit wobbly. Older dogs or dogs with mobility issues may need a ramp that is more stable, and in that case, it's better to opt for the free-standing type. How do I fold my ramp? Depending on the brand you get, what type of ramp you get, and its construction, to disassemble and fold it up for stowaway can differ. Some ramps fold in half. Others fold together three times, and there are others that stack up on top of one another. You also have the option of getting a sliding/telescoping dog ramp with an internal sliding mechanism. They are simple to use and highly adjustable—you can lock the position when you've achieved optimal height. Whether you are transferring the ramp from one car to another, you should first check whether or not the ramp has wheels or a carrying handle so you can easily move it around. Be sure to choose a lightweight ramp to make transfers effortless. The type of material is also an important feature to consider when making a choice between ramps. PVC ramps are durable and long-lasting. They are also waterproof and easy to clean. Unfortunately, they aren't as durable as ones made out of metal, for example. Metallic ramps are durable and more stable. But they are definitely heavier to transfer from one car to another or to move around. Plus, they rust much easier when left out in the rain. What are the important measurements? Climber Slope (26 degrees): If you have a young and healthy dog with minimal joint issues, a steep incline won't be an issue. Normal Slope (22 degrees): For the middle road, a 22-degree slope is perfect for dogs who have some minor issues or impairment or are simply getting older. Easy Slope (18 degrees): This ramp is the target area for dogs who already have bone or joint problems like arthritis. You need to measure the hight of the back of your car and figure out the length you need the ramp to be according to which type of incline you think is ideal for your dog. If you have an another vehicle with a different height or you will be using the ramp in various situations, you should choose a telescoping ramp which can adjust to different heights. We hope that this guide has helped you. If you have any questions, just send us a message - we here at PetHairPatrol are happy to help!